Valla Spa is the world leader in mobile industrial cranes, an industry that has always worked with complex innovation technology. In the early 1960’s Valla recognised the need for a new type of crane for handling materials that would find its place between the fork lift and mobile cranes. It was here that the first mobile industrial crane made its debut. Next, Valla designed the first self-propelled industrial battery crane. In full respect of the environment, Valla has been advancing its clean and quiet technology ever since. 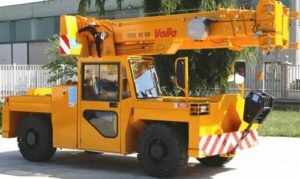 Valla has developed over the decades a full range of mobile cranes from 2 to 90 tons., Electric, Diesel, Hybrid, wheeled or tracked, fixed or swing boom, with dozens of special applications designed specifically to meet the needs of customers.